Indeed, that is an unusual title for a blog post, an unusual title, full stop. However, I want to touch on a couple of issues here in regards to recycling and the responsibility of everyone. 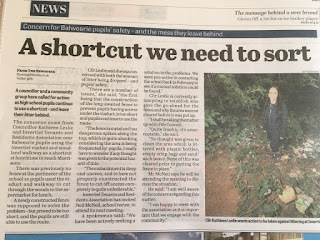 Secondly, there was coverage in yesterday's Fife Free Press over concerns expressed by both myself and Invertiel Tenants and Residents Association over the long running issue of the route by the viaduct being used as a shortcut by school pupils at lunchtime. I struggle to find the words to sum up how I feel about all this discarded plastic - mainly in the form of juice bottles. Plastic is not biodegradable in this form. It will not break down, instead it will just lie there. Look at the area - trees, that provide a whole habitat for wildlife, all the insects and small woodland animals are going to be in amongst that. Not to forget that given the abundance also of sandwich boxes, sweet wrappers and crisp packets, it will attract rats - and the area is very close to houses. * Glass (there isn't so much glass here) can cause injury and death - often through suffocation as small animals, with an instinct to smell objects closely, can become trapped in the neck of the bottle. 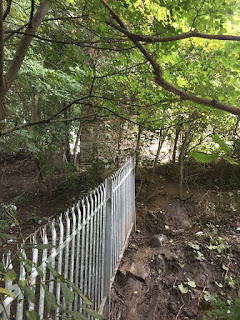 "the land in questions comes under council ownership, the largest area directly behind the school comes under education, having been on site it is clearly a health and safety issue." 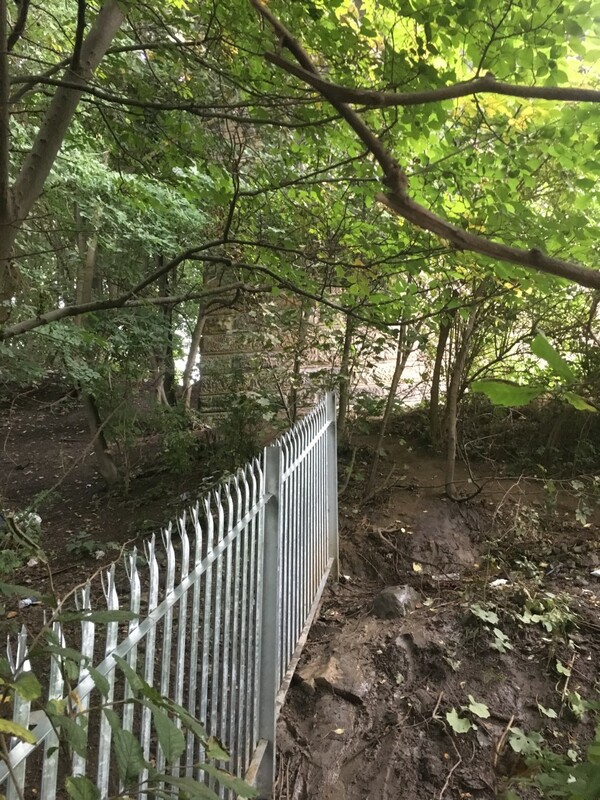 Whilst previously pupils from the school were using the area to the left of the fence they are now using the area to the right of the photo - the idea of the fence was to block off access - completely. That has not happened simply because the fence ends far short of the viaduct wall. The pupils simply use the other, more dangerous in my opinion, side of it. The litter of course being piled up on either side. Additionally, the fence has sharp spikes along the top of it, the potential dangers those present do not bear thinking about. Invertiel residents were keen to have a litter pick up but now, due to the fence, that is not possible from a health and safety point of view. 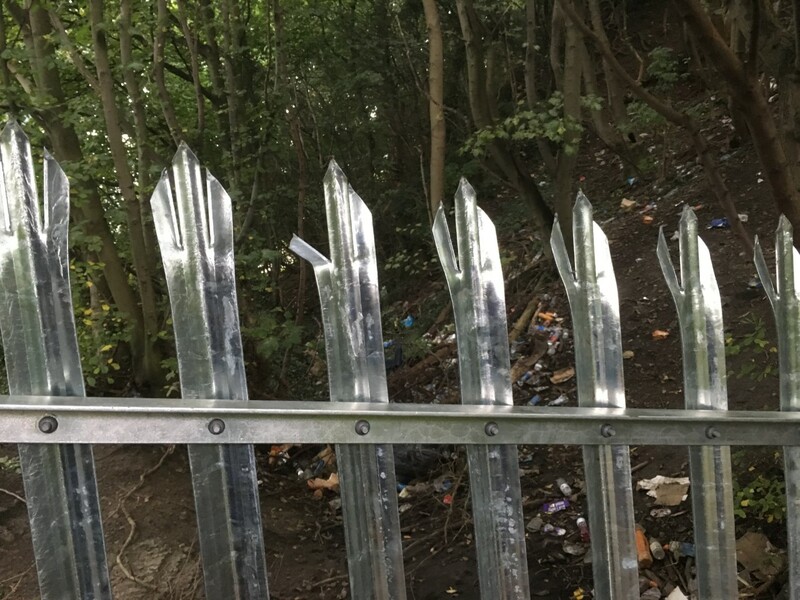 They would have to carefully climb up the slope on the right hand side, cut across and then head down the other side of the slope to gather the litter. An idea had been considered by the previous head-teacher that a pupil group could be involved in any clean up. I would have strong reservations about that though given the access to the site. Whilst pupils are using the route as a short cut at lunchtime, we should not be actively endorsing them to enter into an area such as this given the potential hazards. 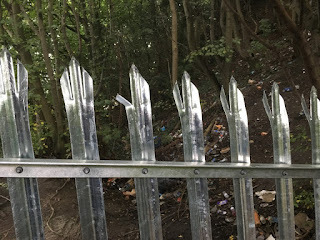 The bottom line is, the area should have been properly cleaned prior to the fence being put in place and the fence should have been designed to stop access altogether. The issue will be discussed further at the next Invertiel Tenants and Residents Association and it is hoped the school will engage fully in the process to seek a solution. Fife Council must also have a role to play in this as they transferred the money over to the school to oversee the completion of a fence. 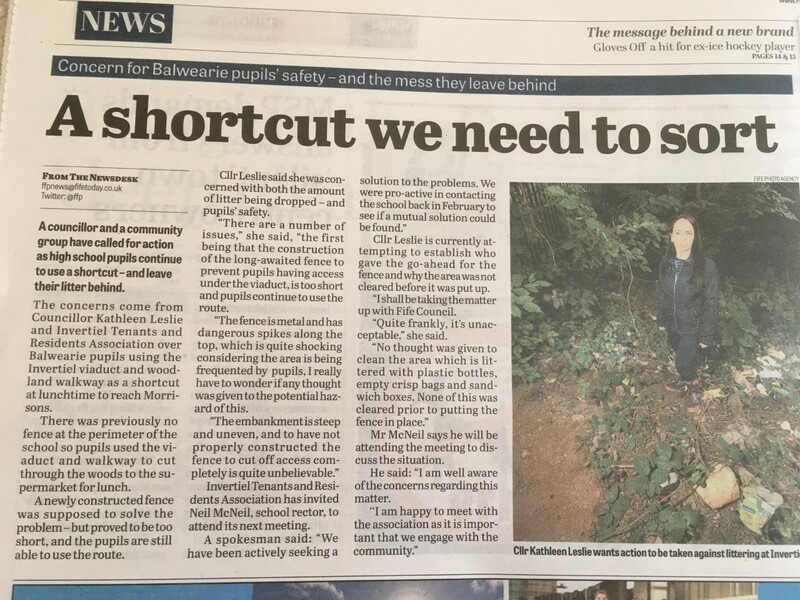 Meantime, I would absolutely urge people not to use the area as a short cut and on a wider note - please really consider the wider implications of dropping litter, particularly plastics, cans and glass. We all have a role to play in protecting and maintaining and cultivating our local environment and wildlife habitats. Recycling is something we are more than well aware of and if you can't immediately find a recycling bin, then carry your plastic bottle until you find one. Please remember - reduce, reuse and recycle.